Who would not want the application that Rapid Reader pretends to be, that is, highlighting any online text that brings up an in-page window to display Wikipedia and Bing results, thus improving the speed of searching and translating as well? But we have to say that, unfortunately, this application is very similar to SearchSnacks, TermTutorm, and WordProser, which are all useless and potentially harmful ad-supported programs. Having Rapid Reader on your computer is not only annoying and disruptive with its continuous flow of third-party advertisements, but it is also an open door to unsafe third-party content. We only see one option for you if you want to stay away from malware infections and online scams, and that is removing Rapid Reader ASAP. This adware can collect information about you and your surfing habits, which allows third parties to send customized ads to your computer screen. These ads are dangerous because you can never know if an ad can be trusted or not. Cyber criminals might utilize Rapid Reader to insert corrupted links under the ads and take you to their malicious websites. Showing you advertisements and offers that seem relevant to you increases their chances that you will click. You need to know that the creators of this adware program are paid per click. Each and every click supports them, and they might as well be schemers who scam people and can stay in business because people do not stop clicking on these ads. The only way you can stop being haunted by such ads is to delete Rapid Reader from your computer. 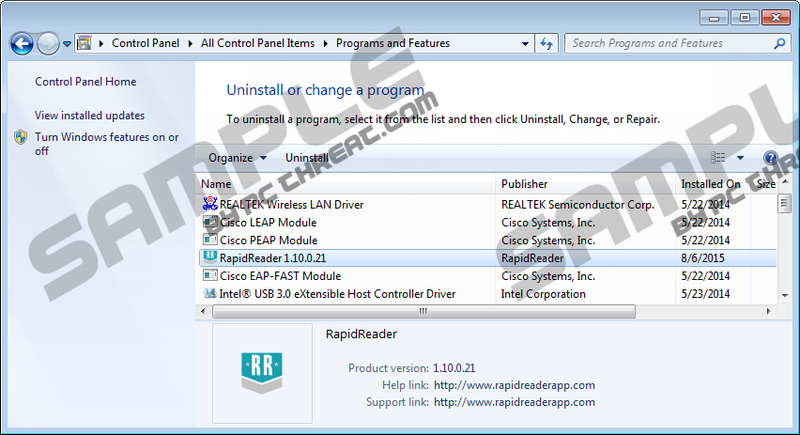 The most common way for Rapid Reader to be spread over the Internet is via freeware bundles. This adware does have an official-looking website at rapidreaderapp.com, but the software is not available for download. This is usually the first suspicious sign that should signal that you are dealing with something fishy. The problem in the case of bundles is that they might include malware, such as adware programs, browser hijackers, and potentially unwanted programs. We have noticed that Rapid Reader may come with VuuPC, PriceLess, and PicColor in the same package. We believe that you can imagine what happens if such a bundle gets installed onto your system. You may start to see now that deleting Rapid Reader may not be enough for you to be perfectly sure that your computer is safe. If you finally arrive at the same conclusion we did and want to get rid of Rapid Reader as soon as possible, you may be relieved to know that it is an easy task even for an inexperienced computer user. If you follow our instructions below, you will be done within a minute. You need to remember, though, that this adware may not be the only infection on your computer. But going after all the possible threats and identifying them, let alone eliminating them manually, could be a tedious job even for experts. Therefore, we recommend you obtain an automated solution, i.e., the use of reputable malware removal software. That is the best possible option if you do not want similar or even worse malware attacks to take place. However, it is also important to keep all your programs and drivers up-to-date to lower the number of vulnerabilities cyber criminals might want to exploit. Tap Win+X and access Control Panel. Quick & tested solution for Rapid Reader removal.